From Würzburg’s main station it is about a 15 minute taxi ride to Hofmannstraße. 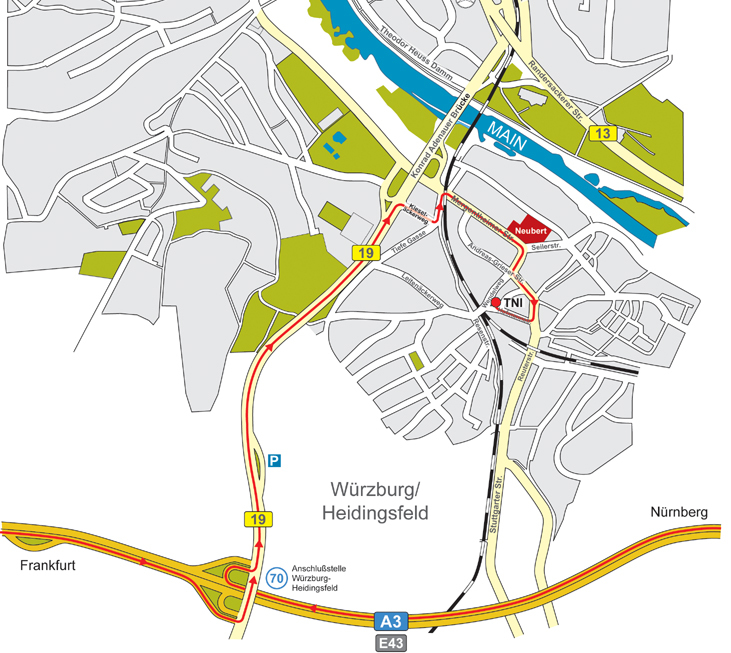 Coming from A3, exit “70-Würzburg-Heidingsfeld”, drive on the B19 direction “Würzburg-Heidingsfeld”. Take the exit direction “Ochsenfurt / Heidingsfeld / Lehmgrubensiedlung”. Keep left on “Kieselackerweg”. “Kieselackerweg” continues lightly left and becomes “Tiefe Gasse”. Keep right and turn right into the “Mergentheimer Straße”. At the traffic lights turn right into to the “Wendelweg”. Follow the course of the road. You compass the “Andreas-Grieser-Straße”. After the traffic lights turn into the first street right into the “Hofmannstraße”. Drive until the end of the road, you compass “Hofmannstraße 8”. Either you come from Frankfurt/Main with the IC or ICE train to Würzburg (about 1 hour) or you come from Nürnberg with the IC/ICE train to Würzburg (about 1 hour). From the main station it is about a 15 minute taxi ride to “Hofmannstraße”.